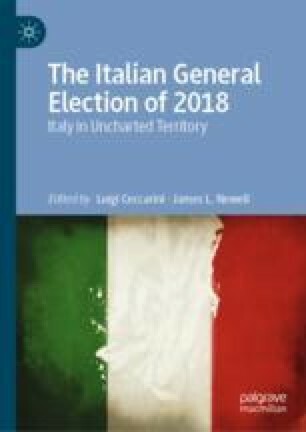 This chapter seeks to analyse the actual impact of the 2018 Italian general election on the political and social profile of the Italian parliamentary elite. The two basic questions addressed here are as follows: Is the extent of change brought about by the election comparable to the changes brought about between 2006 and 2013? Are the MPs coming from the two parties supporting the new government (the League and the Five-star Movement) substantially different from those coming from mainstream parties? To address these questions, this chapter provides an in-depth analysis of the political composition of the Lower House elected in 2018 compared to those of the past twelve years. The chapter discusses a typology of MPs to assess changes that have taken place over the course of the past few legislatures. Then, an analysis of the evolution of the different patterns of political selection and political career, across time and by party, is offered. Emanuele, Vincenzo. 2015. Dataset of Electoral Volatility and Its Internal Components in Western Europe (1945–2015). http://dx.doi.org/10.7802/1112.